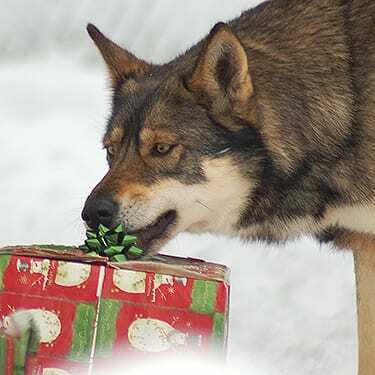 BIO ~ Azteca is a spayed female domestic dog, most likely a malamute and German Shepherd mix. She was born in 2007 and mislabeled a wolf-dog. RELATIONSHIP ~ Azteca is part of our Nola Pack. She lives with her brother Saint, and her sisters Goldie, Katrina and Juno. Although she loves all of her siblings, she is especially close with Saint. You can visit the whole family on our tour path! LIKES ~ Azteca, like her sisters in our Nola Pack, absolutely loves her brother, Saint! She loves to go for enrichment walks as long as he goes, too. Although you may not expect it, our Alpha girl also loves belly rubs from caretakers she’s very comfortable with. DISLIKES ~ Azteca does not like when her sister Katrina challenges her. There have been several occasions when Azteca has to remind Katrina that she is the Alpha. Azteca also hates when her brother, Saint, goes for a walk without her. FUN FACTS ~ When our Nola Pack first arrived, we had trouble telling apart Azteca and Katrina before we knew their personalities. We looked at their cheeks to see who was who! Katrina has round spots on her cheeks and Azteca has triangles. WISH LIST ~ Azteca, Katrina and Saint take high-quality joint supplements, to help with their bad knees. She would love a donation for more, or more directly from our wish list so she can stay active and more comfortable! Thank you for your vital support! Azteca is Still Looking for Sponsors! AZTECA’S HISTORY ~ Beautiful Azteca was one of five domestic dogs who was taken to a shelter in Louisiana when she was only 7-weeks-old. They were mistaken as wolf-dogs. 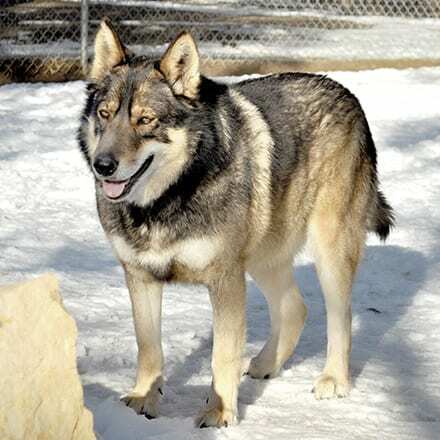 Like many dogs sold as wolf-dogs, we think they are most likely a mix of malamute, German shepherd, and husky. Because they were labeled as wolf-dogs, it was almost impossible to adopt them out. Azteca, her sisters Goldie, Katrina, and Juno, and her brother, Saint were all placed together in a 10 x 10-foot cage with a concrete floor and became completely unsocialized. While at the shelter, someone would occasionally try to adopt one of the dogs, but they were always returned. The shelter called Wild Spirit in August of 2009. One of our staff members was on vacation in the area so she stopped by to see them. They were kept clean and fed but had spent two years together in that awful 10 x 10 cage, which caused permanent damage to their knees. They all had learned to move together as a pack in their tiny space. We couldn’t stand to see them spend the rest of their lives there. We made arrangements to accept them at Wild Spirit and they became our Nola Pack. Despite still being shy, our Nolas are very sweet and loving dogs. For the sake of keeping the closely-knit family together, we decided against adopting them out. We have given them the best possible care, including knee surgeries for Saint, Azteca, Katrina and 14 weeks of physical therapy after each surgery. This precious family does a great job helping us educate folks on our tours. Their story is the perfect example of the fact that many of the canines sold as wolf-dogs are just domestic dogs. Incorrectly labeling a domestic dog as a wolf-dog, or even worse, a wolf, is a horrible disservice to both dogs and wolves. People get the impression that wolves and wolf-dogs are just like domestic dogs and will act accordingly. Sadly, most people who actually buy a wolf-dog or wolf very quickly realize they are not at all like domestic dogs. Sanctuary and rescue spaces are very limited. Most shelters will not adopt out wolf-dogs so they end up being euthanized. 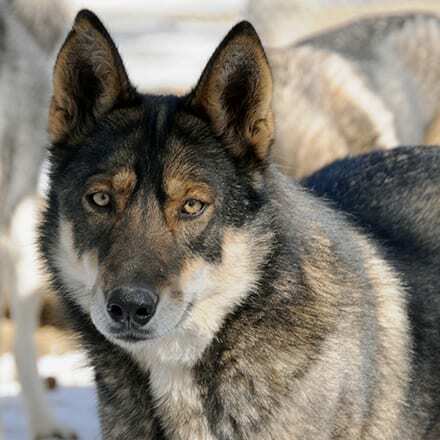 Azteca and her family help us demonstrate how the wolf and wolf-dog breeding industry hurts everyone, even those who are not truly part of it.